Over the last 150 years, many aspects of Japanese lifestyle, including breakfast, have been heavily Westernized. The percentage of people eating a Western style breakfast of bread and eggs is highest among salarymen and those who live alone, while students and people whose breakfasts are prepared by their mothers more frequently enjoy a Japanese style breakfast. 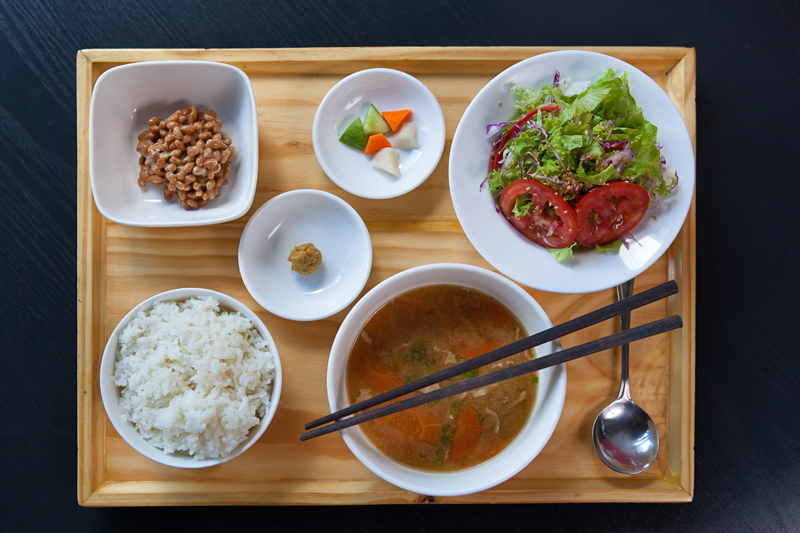 Owner of Achaya Café, Ayako Fuji, has now taken on the role as substitute mother for the city’s denizen by recently adding a traditional Japanese breakfast menu to her restaurant. 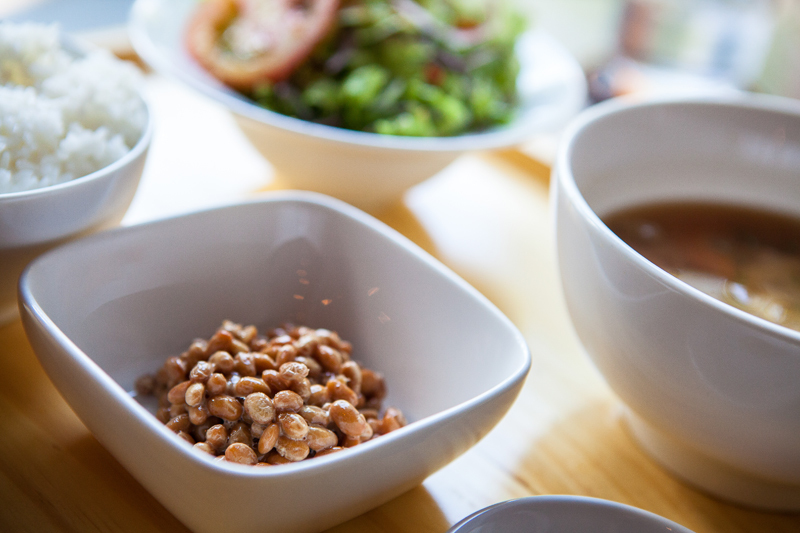 “A majority [of Japanese] eat natto as a healthy start to their day,” says Ayako. “Eat it with soy sauce, the pickled vegetables (carrots, daikon and cucumbers) and the pork miso soup (made of thinly-sliced pork, carrots, potatoes and onions in a hot pork and miso broth).” Natto (VND98,000) is fermented soybeans, notorious for their pungent smell but paired with the right foods, chosen especially by Ayako, they become a delicious accompaniment to the dish. Natto takes two days to prepare in a consistent temperature of 40 degrees Celsius. If you are daring, stir in a bit of Karashi mustard paste – strong and spicy like wasabi – too much may cause an explosion, but a little is enough to go a long way. And to cool down your palate after that adventure, try the fresh salad that’s included with the special dashi fish sauce dressing that’s specially imported from Japan. Another symbol of a true Japanese breakfast is the sakeno siokouji yaki teishouku (VND138,000) or better known as salmon. Yes, Japanese folks eat a great deal of fish and breakfast is no exception. 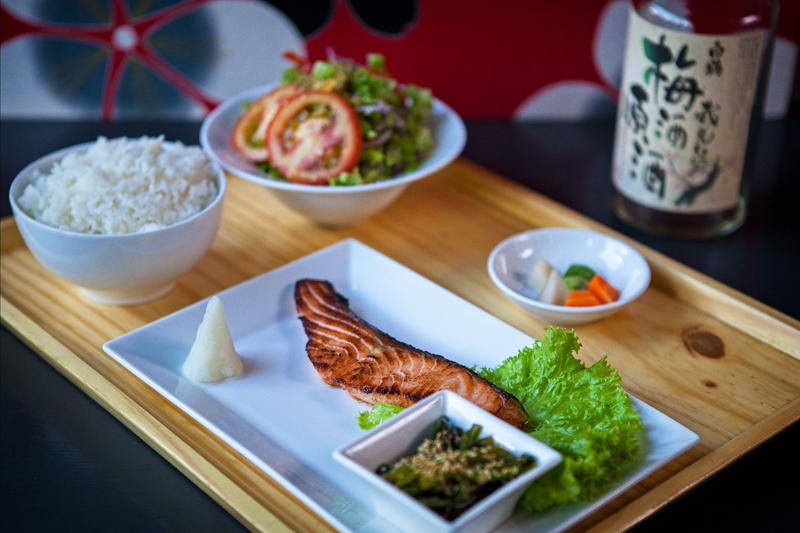 At Achaya Café salmon is imported for the sake of quality and then marinated in shio-koji, a natural Japanese seasoning (also imported) that helps tenderize and add a touch of sweetness without overpowering the dish. The perfectly cooked salmon – not too well done – is paired with a bowl of white rice, side salad, grated daikon and sesame spinach to refresh your palate. A hearty Japanese breakfast provides energy all through the morning, without getting the 10am faintness one may experience after eating the usual breakfast quickie. And if you can venture beyond Japanese sushi, this place would be worth rolling out of bed for.